This week’s on Meet The Press opened with David Brooks of the New York Times and Andrea Mitchell of NBC News discussing the headlines out of Israel, Gaza, and Egypt. Mitchell said the Obama Administration is very worried about moves by Egyptian Pres. Morsi to seize new powers. She said that it has really put the administration in a bind. Brooks said the first piece of good news is that the Obama Administration did “an excellent job supporting Israel” during the recent conflict. The second piece of good news, according to Brooks, is that Egypt saw an interest in promoting stability across the Sinai. The bad news however, says Brooks, is that “nasty Islamicists” are now in control in Palestinian areas and in Egypt, and there will be no peace as long as they are in control. Brooks says American policy has to be about building up the non-Islamicists in the Arab world and in Iran. 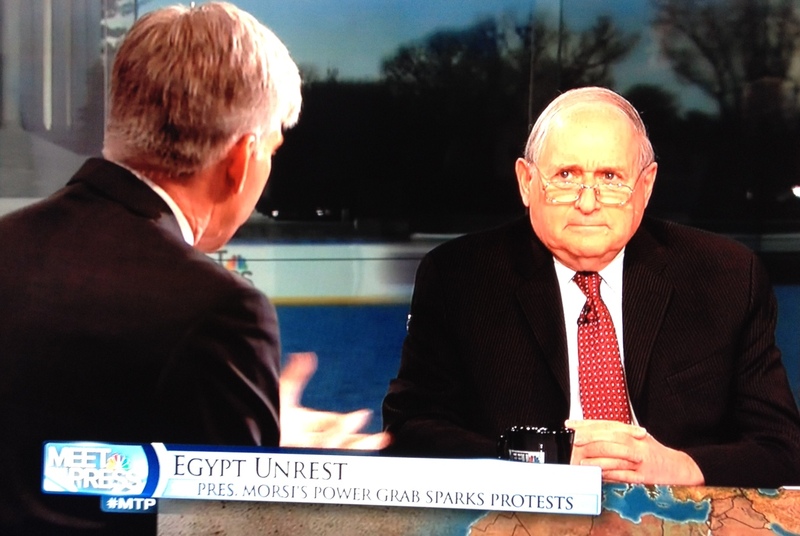 Levin warns that we can’t have a democratically elected autocrat in Egypt. He also said the key for the Obama Administration is keeping the pressure on Iran to keep them from sending more missiles to Hamas. On Syria, Levin said that if the opposition can unify, the United States should consider imposing a no-fly zone. Again, Levin repeated that keeping pressure on Iran is also vital in solving the Syria crisis. Regarding the fiscal cliff, Levin said everyone should be very worried. “The key here is whether or not the Republicans will move away from their ideologically rigid position,” said Levin. Real and/or effective tax rates must go up, and tax loopholes must be closed, according to Levin. Next up was Representative Peter King (R-NY) who said he agrees with recent comments by Senator Saxby Chamblis (R-GA) that the Norquist pledge against raising tax rates may need to go away if we want this problem resolved. King believes Speaker of the House John Boehner and President Obama will be able to reach a budget deal. The larger roundtable included Brooks and Mitchell joined by Rev. Al Sharpton, filmmaker Ken Burns, and businesswoman Carly Fiorina. Gregory showed a quote from New York Times columnist Tom Friedman who wrote that the president should make the enthusiastic case that solving the fiscal cliff problem will create abundance for all. Burns agreed, and Brooks said, “America is one budget deal away from becoming the hot spot of the world.” However, Brooks added that Republicans will not give on taxes unless the president is aggressive on spending cuts. Finally Congressman Gregory Meeks (D-NY), who represents some of the people hardest hit by Hurricane Sandy, discussed recovery efforts in his district. The Gregory led discussion on the fiscal cliff seemed to be cleverly orchestrated to advance the cause for higher taxes with no regard for spending. First the argument that Obama’s win constituted an endorsement of tax increases. Then the moral play that those who are deemed to have done so well must now lead with unconditional sacrifice. Then a casting of Lincoln’s emancipation proclamation as the same kind of bold unconditional act that must now be forced upon today wealthy. Finally, a Lincoln rooted argument from Brooks no less, that to be a successful politician one must be willing to sacrifice all integrity. All the while, Rev Al sits with hands folded nodding piously and chiming in on the morality of socking it to the rich. Gregory advanced the Democrat playbook. Demand an immediate sacrifice from the wealthy with hints that only by first socking it to the rich can we have comprehensive reform. With the new taxes in hand, reset the stakes, demanding a new “shared sacrifice” for any spending reform. In other words, jack taxes now, then demand additional sacrifice for any cut that is put on the table. The tax to cut ratio that started at 4:1, is now at 3:1, will end up close to 1:1 after two rounds of tax increase are demanded. Will Gregory ever take an honest look at what is required from all of us to get out of the mess we’re in? Shame on you for allowing Ken Burns to allow the Race Card to be used to against the tea Party, Texas, and Conservative America. And creditable Al Sharpton did not mention Twana Brawley. You owe us Black Americans, like me, an apology. What a shame, the election is over. People who think government can and should provide them with things voted for someone who promised government WOULD do that. He and they think the way to pay for it is to take from anyone who earns anything (taxing the “rich”) or taxing capital gains (taxing people who have saved all their life and are trying to depend on their own savings, not government to sustain them). This administration doesn’t like anyone depending on themselves. Their vision is everyone dependent on government. All their policies, from bailouts to extending unemployment to taxing the “rich” are aimed at creating government dependency. Did you ever get a job from a poor person? Carl Levin mentioned that closing loopholes on overseas earnings would bring in “tens of billions”. That won’t pay for the TRILLIONS government spends trying to provide things for people. Our news media are he;ping promote the unrealistic dream that socialism can help people when all it’s done in every place where it’s been tried is make people miserable. How many people risk death to flee the United States to get to Cuba in flimsy boats??? ?